The Professional Toastmaster is a traditional part of British Banqueting. I am a fully qualified Toastmaster, I trained with the Toastmasters Training Limited and qualified in 1999. I am a Member of the Northern Guild of Toastmasters their first Lady Toastmaster! I perform the duties of a Toastmaster or a Master of Ceremonies which includes meeting and welcoming the guests, directing them to the appropriate place or room, organising a receiving line, making announcements and introducing the guest speakers,helping with raffles and presentations. I also interact and work along side the organiser, event co-ordinator, banquet manager etc., keeping an eye on the time by moving people on and helping to make the event or occasion run smoothly. I am also fully trained in protocol and etiquette procedures. Why did I decide to be a Toastmaster? I have been involved in travel and tourism for most of my working life, stopping for a few years to raise my children and to help my husband on our sheep farm in North Wales. I am currently employed as a singles host with a reputable over fifties travel company. I have had a lot of experience in dealing with groups of people, attending to their needs and requirements, and what I have found is, that first and foremost I enjoy my work! 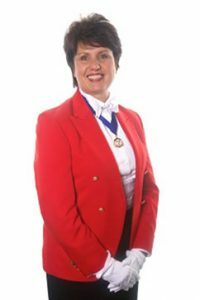 After years of experience with working in the travel business and organising events, it seemed a natural progression to become a Toastmaster and after an extensive training course with Toastmasters Training Ltd I was delighted to have been accepted into the Northern Guild of Toastmasters as their ‘first’ Lady Toastmaster. I have now been awarded my ‘Blue Ribbon’ as a full member, denoted by the special collarette, which is awarded for a combination of competence, qualification and experience.